Most often Amazon marketplace is described as “there are currently more than 2 million sellers on Amazon worldwide.” The 2 million figure has become common speech. But it is wrong. Not only is the marketplace bigger in terms of the number of sellers, but it also has better metrics to benchmark its performance. All marketplaces worldwide have attracted millions of sellers and yet few of them have built a meaningful business. It is thus crucial to look beyond the millions of sellers and instead try to measure how many of them are a success. Amazon marketplace is growing by more than a million new sellers a year, pushing the total number of sellers to at least 6 million. Amazon first mentioned two million sellers more than 3 years ago on January 2015. This is a safe estimate - since the marketplace inception two decades ago it likely attracted more than 10 million sellers. Currently there are 570,000 sellers with a review in a month, up from 480,000 sellers last year. One way to look at the size of the marketplace is to analyze how many of those millions of sellers had at least one feedback review in a month - sellers receive feedback reviews from customers after a purchase. Of course some sellers end up with no reviews even after having a few sales as not all customers leave one. 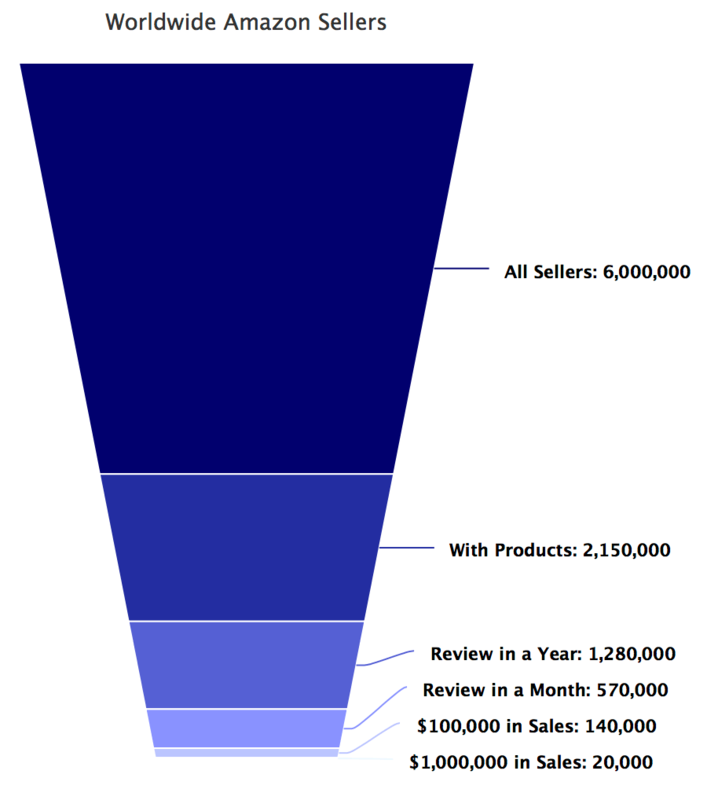 1,280,000 sellers received at least one review in a year, up from 1,180,00 a year ago. In an attempt to increase the size of the pool, the feedback review window is increased from a month to a year. This catches all sellers who had at least some activity during a year. Many marketplaces reporting an active sellers figure do it based on a year of activity. Today 2,150,000 sellers have products listed for sale, up by 35% from 1,600,000 in 2017. From a single product, to millions of them. This is an indication of sellers who have made some attempt to have sales, but it does include many sellers who have products listed for months or years and never had any sales. There are 140,000 sellers with more than $100,000 in sales as reported by Amazon. This number has grown from 100,000 in 2016, and doubled from 70,000 in 2015. Outside of the metric to follow this is probably one of the most useful metrics to follow as it captures all sellers doing it seriously. In the end there are 20,000 sellers with at least $1,000,000 in sales a year. This small group of sellers generate most of the volume on the marketplace (at least $20 billion), and given the typical retail revenues are the ones to have built a business on Amazon. Close to half of those 20,000 sellers are based in the US, with the UK and Germany next. This is the Amazon marketplace funnel. Millions of sellers at the top, only tens of thousands at the bottom. This is how most marketplaces look like. They are all “top heavy”, meaning the top few percent of sellers are responsible for most of the volume.